Oriton is a tool for making custom tables (lists of custom encodings and the hex values that represent them). It has support for adding known orders (in the way of whole encodings, available on right click in the cells), supports 16 bit encodings (and beyond) and has a very nice regular expression style input. Dual and multiple tile encodings are well catered for. 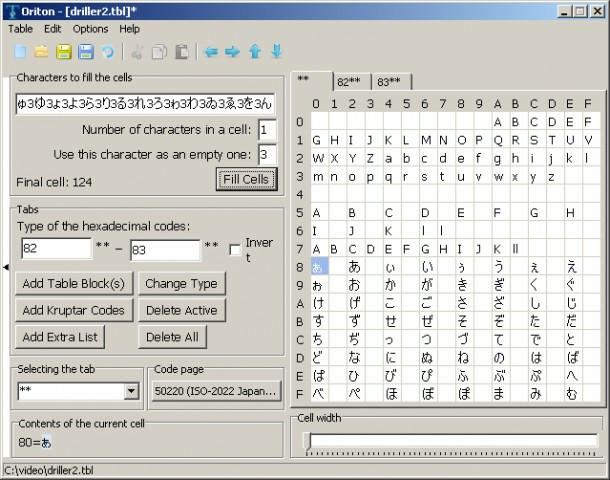 It is also designed to support Kruptar (a well liked text extraction utility) codes. Fixed crash if backspace was pressed when editing the first cell in a field. Added ability to hide the left panel in the main window.